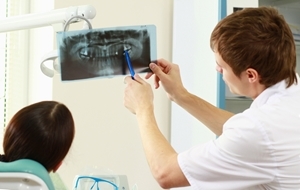 When people have problems with their teeth, they go to the dentist office to have an exam for cavities or gum disease. They don’t necessarily think of dental issues in terms of heart health, blood sugar level or respiratory illness. But a number of research studies indicate they should consider the whole body when they are having dental pain because it could be an indication of more serious health concerns. During American Heart Month in February, every aspect of cardiovascular health is in focus. From clogged arteries to high blood pressure, people should be aware of the steps they can take to reduce or eliminate unhealthy conditions that could lead to a stroke or heart attack. Scheduling an appointment with the family dentist is one of them. For people who are at the greatest risk of gum disease – at age 40 or older – regular exams are especially important for those with diabetes. When gingivitis, the most common form of gum disease, evolves into the more serious periodontitis, there is an increased risk of developing type 2 diabetes and exacerbating an existing case. While this form of diabetes can be regulated with a healthy diet and medication, people with advanced gum disease have to monitor their sugar intake to make sure it doesn’t create unhealthy glucose levels. Whatever the debate, people should keep their dentists informed of existing health conditions to help devise treatments that will be most beneficial. By making them part of a person’s medical team, they will be in a better position to deliver dental care that keeps one in optimum shape.